It is all about the story. Whether I am producing a 60-second promotional piece, a technical visualization or an hour-long documentary the story has to be clear, concise, and engaging. From script to screen I work collaboratively with my client to identify the essence of the story. For the past 15 years I have worked with military and other DoD organizations producing documentary style videos of their more unique training missions, informational videos used at conferences worldwide, and technical visualizations to describe a new technology or site characterization. Over 16 years telling the story of new concepts and technologies. 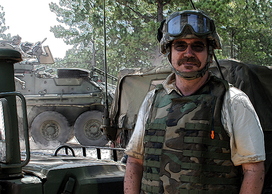 For more than 16 years I have proudly worked with some of America's most elite forces in a variety of capacities, environments and situations. I currently hold a TS-Clearance. The view from above tells a story that can't be told from the ground. There are many excellent drone pilots out there, but not many of them possess the photography and cinematic editing skills I have developed over the years. When you combine the two you have a powerful means to convey your message. As a one man production team I quickly learned the importance of an effective narration. I discovered that saying too much is just as bad as not saying enough. I strive to let the subject tell their story in their own words and through imagery. There are times when a piece needs narration. Tone of voice, inflection and understanding cinematic beets are important pieces to striking the balance and effective story telling. This is where my journey into digital media began. I am an expert user and former instructor of 3D Studio Max. I created a library of over 800 models for a visualization tool used by the military. In addition these skills have been used to create countless scenes consisting of animations and special effects for many of the technical videos I have produced. note - Samples will be provided upon request.